The new Guru Rig Case is set to be a massive seller in 2014. As always with Guru tackle, it features some clever design features including a compact, double-sided, magnetic fastening case to increase its capacity up to 150 rigs. 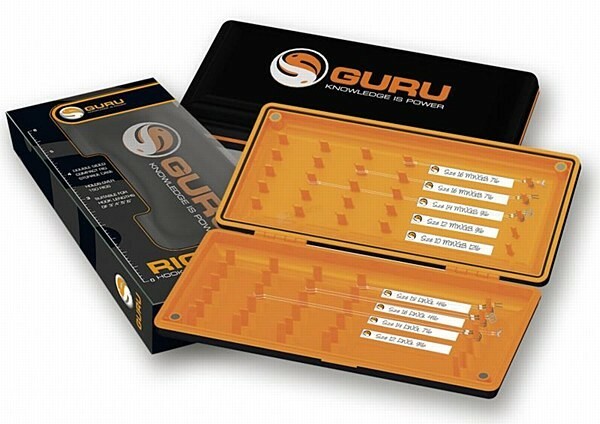 As always with Guru tackle, it features some clever design features including a compact, double-sided, magnetic fastening case to increase its capacity up to 150 rigs. It can accommodate hooklengths that are intended for method feeder, pellet feeder and pole rigs of 3, 4, 5, or 6 inches in length. The magnetic fastening ensures that your rigs are protected when in transit and also makes the case totally water resistant.